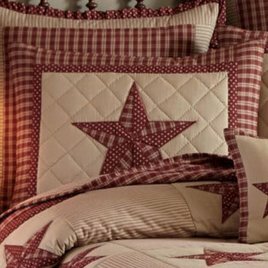 Sturbridge Patch Wine bedding by Park Design portrays crisp colonial 5-point stars in a well-ordered patchwork design. Each quilted star is embedded in a khaki field, blocked with squares of wine and khaki stripe. 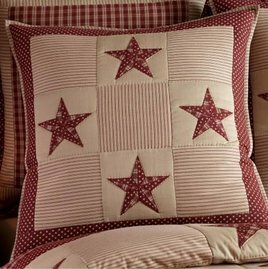 This quilted pillow sham features a large wine patchwork star in the center against a tan background. Around the tan fabric is a 1" border of wine fabric with tiny tan stars then another 2" border of a wine/tan plaid surrounds the first. 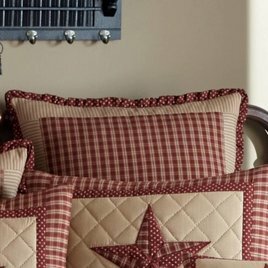 The Sturbridge Patch Wine bedding collection coordinates with the Sturbridge Wine collection found on our website, allowing you to update multiple rooms in your house with this fabulous pattern. The Sturbridge Patch Wine Basic Euro Sham features a center of deep wine/tan plaid fabric with a 1" border of wine/tan ticking. A small ruffle of wine fabric with tan stars runs along the outside of this sham giving it a finished look.